I'm trying to migrate from Chrome to Firefox under OS X and this issue is extremely annoying. In Chrome pressing the Cmd key is a universal for "do this in a new tab" command. It works for addresses, search and clicking on links. In Firefox for some reason they decided to use Cmd for new tab when clicking but Alt/Option for new tab when entering something in the address bar. How can I remap the address bar and search from Alt + Click to Cmd + Click? 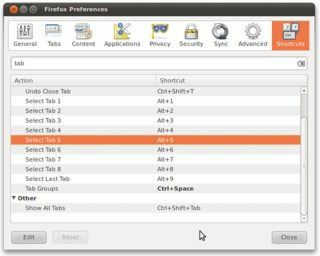 You may install Customizable Shortcuts add-on for Firefox. Once the add-on is installed, a new tab will appear in the preferences window which allows you to remap/customize or disable most of the shortcuts offered by Firefox. Alternatively you can use Middle-click instead. Not the answer you're looking for? Browse other questions tagged macos firefox firefox-extensions or ask your own question. What is the HTTP referrer for Firefox when opening a link in a new tab? How to force Chrome to open all links in the current tab? How can I change the modifier to open search results in a new tab in Firefox back to Alt? How can I change the new tab behaviour in Firefox?